Owen Sparks, a 23-year-old millionaire, desperately wants a change in his life. With his success and hard earned money comes headaches, constant phone calls and people always asking for more money. He feels as though he never gets a moments peace and subsequently finds no enjoyment or happiness in life. He wants to get away from it all, and in his mind the perfect place to do this is on an uninhibited island in the Maldives. Calia Reed, a beautiful British girl vacationing in the Maldives with her brother James, meets Owen on her last night in town and decides to extend her trip and join him on his island adventure. Same uninhibited island as T.J. and Anna, same dangers, the only difference is they have plenty of supplies and Captain Forrester knows where they are and can come "rescue" them whenever they desire. Even though Owen thought through and planned everything out perfectly he had no idea things could take a turn for the worse or that one decision alone could have such an effect on anyone other than himself. One day he shows up on the doorstep of Anna and T.J.'s house and you are going to be blown away with the story he has to tell, especially their connection to one another. Owen's story and adventure is just as good of astory as Anna and T.J,'s, in fact after hearing both it's hard to believe they were even "stranded" on the same island. The obvious difference of course being the choice in which each came to the island. For me, having everything take place in the exact same setting is one of the things I loved most about this book. It felt like a completely different place through the eyes of Owen Sparks. Another thing I really enjoyed was catching back up with Anna and T.J., experiencing their emotions as Owen explains the details of his time on the island. Watching them first hand deal with their emotions as they realize the effect of Owen's decision on the outcome of their lives. Anna and T.J. have grown so much emotionally since we met them in the first chapter of On the Island and getting to see them continually living their HEA was icing on the cake! If you haven't already read On the Island, you absolutely need to read it before Uncharted, however if you have read the first book then please don't miss out on this companion novel. It absolutely enriches the entire On the Island experience. 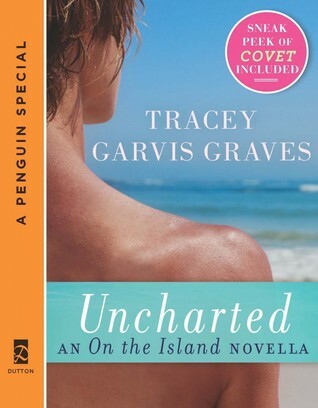 Tracey Garvis-Graves writes with such beautiful descriptions and emotional depth that you cannot help being sucked into her stories.